Lulu, my husband, loves French food. Unfortunately, French cuisine does not have a lot of vegetarian options. So I decided to make a vegetarian version of one of the classics of French cuisine. 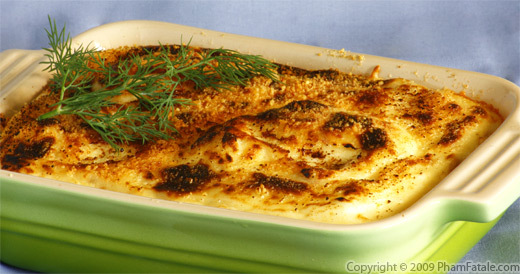 Scottish folks may claim Shepherd's Pie as their own invention, but it it is an unambiguously French version of the dish that was created for Louis XVI by the proprietor of an apothecary, named Parmentier. Louis the XVI was so taken with the dish that it became a royal staple. The main differences between the Scottish and the French dishes are that in Scotland, contains a vegetable medley and is made with stewed mutton, in the French version, there are no other vegetables besides potatoes and the meat of choice is ground beef, not mutton. In a small pan, heat the oil. Add the garlic and cook until it's slightly golden. Remove the garlic from the pan and set aside. Add the shallot to the remaining oil in the pan. 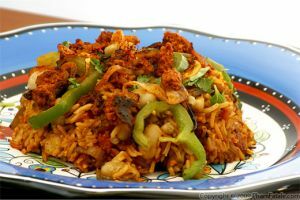 Cook until it's golden, then add the vegetarian chorizo, the roasted bell pepper and the marinara sauce. Remove from the heat. Add dill. Place the washed potatoes into a large pot. Cover them with water. Bring the potatoes to a boil for about 7-8 minutes. Add salt to the potato water. Cook for another 7-10 minutes. The potatoes should be fork-tender. Drain the hot water and discard it. As soon as they are not too hot to handle, peel the potatoes. Mash them using a potato masher. Add butter. Return the potatoes to the pot. Add the heavy cream, sour cream, the golden garlic, chopped sun-dried tomatoes, salt and pepper. Spray a thin layer of oil in a casserole dish. Add the vegeterian chorizo. Spread the mashed potatoes on top. Finish by sprinkling powdered parmesan cheese. Place the casserole in the oven and bake for 25 minutes. Broil for another 2 minutes. Remove from the oven immediately. Garnish with a sprig of dill. 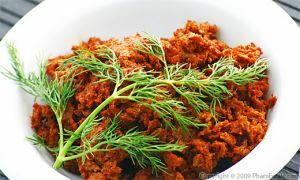 The vegetarian chorizo has a similar texture to ground beef. The spices really add an extra dimension of flavor to the dish that plain, bland tofu cannot. I'll post the recipe of my homemade vegetarian chorizo very soon. 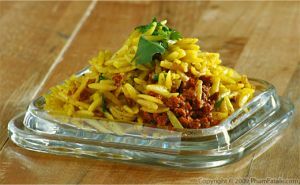 There is a great store-bought product called soyrizo that you can use if you don't feel like making it yourself or if you can't wait for me to post the recipe. I finely chop a chunk of parmesan and place the morsels in a mini food processor to obtain parseman powder. Roasting bell peppers is pretty easy. Wash the bell pepper, pat dry, then brush with oil. Place a grill on your stove and char all the skin of the bell pepper. Wrap in aluminum foil. Let cool for about 10 minutes. Wash the bell pepper under running water and the skin will come right off. Seed it, then dice it. I got Himalayan pink salt from my last trip to Paris. I just found that it is now available in Whole Foods. It's quite different from the regular salt and somehow has a less salty and much flavorful taste. I love it! Published By: Jacqueline Pham on May 16, 2009. Mmm, I bet you and Lulu loved this one. Veggie shepherd's pie sounds delicious!! Sorry I've been away from blogging/commenting for so long. I just finished up with my exams and am finally getting around to my google reader :) Everything looks delicious! Thank you for commenting on my little vegetarian blog. I don't have much opportunities to find vegetarian options (and, I like to do everything from scratch). Nice recipe! Scottish or French version. I'd enjoy cooking and eating this food either way! French or Scottish ( or even Irish), a traditional Shepherds Pie is always made using lamb/mutton. 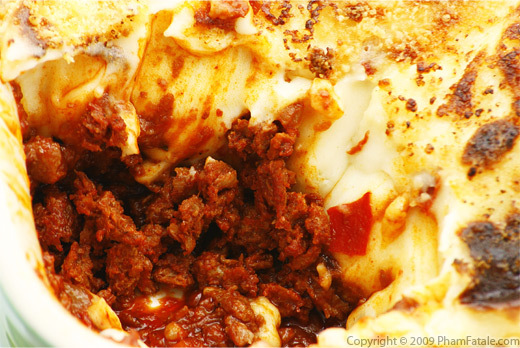 Substituting beef for the lamb/mutton would constitute a traditional Cottage Pie.